Ah summer. It appears you have arrived. 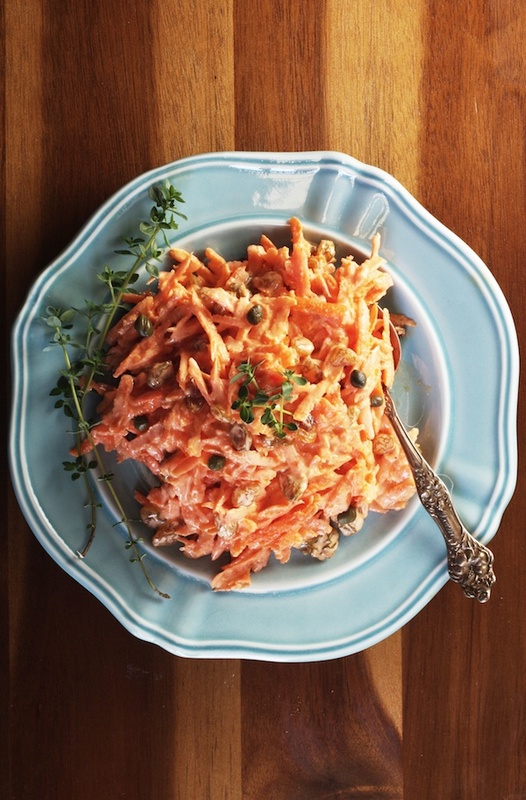 This Healthy Carrot Salad is proof. Some of you are probably jumping for joy at the warm temps and hot sun. I am too, for the most part. But yesterday I was reminded of what summer means here in Denver. It means HOT. Lots of HOT. Like, I can't even look at my oven because the temperature in the house will go up at least 10 degrees. Thus begins my search for no-cook recipes that will help me get through those unbearably warm days. It's a challenge I'm happily accepting because I have the opportunity to look at food in a different way. For much of the year I'm all about stewing, braising, roasting and the like. So looking at food in a way that showcases its natural flavor and beauty is quite refreshing. I've made it sound like my mind goes directly to healthy recipes. Not true. Not at all. Summer salads are a huge weakness for me. I love the dressings, the fresh produce, and their cool, creamy textures. I don't love how quickly all the extras make the calorie count sky rocket. Mayonnaise and sugar galore. Not good. 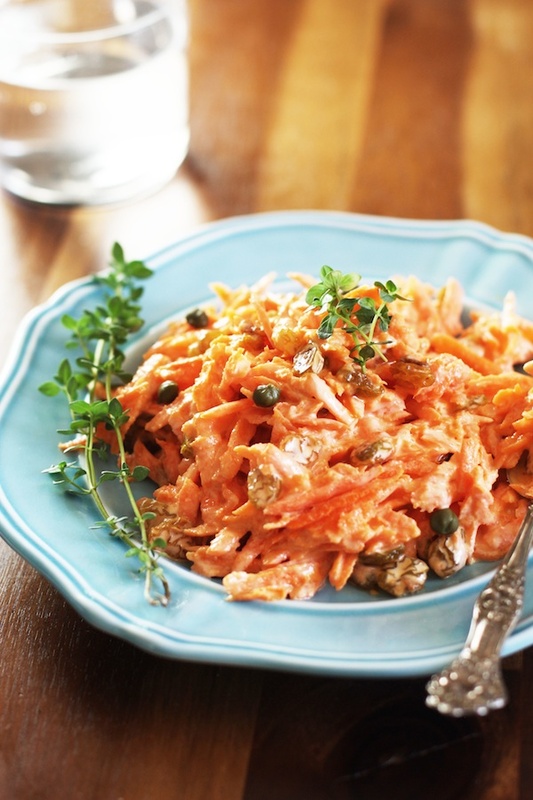 To give myself a healthy go-to summer salad, I took the classic carrot salad (typically heavily laden with mayo and sugar) and made it lighter. It is studded with golden raisins and salty capers and dressed in a combination of plain yogurt, apple cider vinegar, and a tiny touch of mayo. I added a little honey to my salad, but you could easily omit this since carrots are already so sweet on their own. What are your favorite no-cook recipes for summer? I need more ideas, ASAP! In a large bowl, whisk the yogurt, mayo, apple cider vinegar, honey and salt together until smooth. Add the carrots, raisins and capers to the bowl. Toss well to combine and coat with the dressing. Garnish with fresh herbs like lemon thyme, basil, dill, or parsley.